I hope to actually write a more detailed birth story later, but for now I'll give you a rough overview of how it all went down on Friday. On Thursday afternoon, we found that I was beginning to develop pre-ecclampsia again. I was to monitor my blood pressure at home, and if he didnt come on his own over the weekend, we would be inducing on Monday. We immediately asked for prayers from friends and family, but also prepared ourselves for the possibility of an induction. That night, at around 11:30, in a very quick answer to prayer, my water broke! We got to the birth center around 1:00, and after checking in and getting my vitals checked, we were happy to learn that my blood pressure was actually lower than it had been previously. Contractions picked up on their own, and Luke was on his way! Matt caught a few hours of sleep, since neither of us had slept since Wednesday night. My mom and sister were there with me as well, and we walked around the birth center for a while to keep labor progressing. It did. Matt was a wonderful labor coach, even if I did yell at him a few times. At one point he and I were walking outside, and during one contraction I stopped to get through, we looked up and both saw a shooting star streak across the dark skies...it was so beautiful. Shortly after the above picture was taken, my contractions REALLY picked up, and I got into the birthing tub. The water was relaxing, but the pain was so intense. It's all kind of blurry at that point...I remember looking into Matt's eyes, and suddenly feeling the need to push. At 7:00 AM I started pushing, and despite feeling (and saying...many times) that I could NOT do this, at 7:17 AM Matt caught our little guy as he made his entrance into the world! I just couldn't believe he was actually here. It was without a doubt, the most intense thing I have ever done, but so very worth it. After he was born I just stared at him...I still just stare at him actually. I can't believe my body grew another beautiful little boy! I thought he looked so tiny, but he weighed in at 8lbs. 4.5 oz, and was 20.25 inches long, with a head FULL of dark hair. I remember feeling frustrated after Jack's birth, because Matt hadn't been able to be as involved as we had both wanted. But this time? Matt was a HUGE part of the whole process...I have told him many times, but there is no way I could have done it without him right there. I just can't believe I have two beautiful sons. Both Luke and I were doing great several hours after his birth, and around 11:00 AM we were given the all clear to head home. We settled in, and are happily adjusting to life as a family of four! Luke has been sleeping well, and just like his brother - he is a nursing fiend. 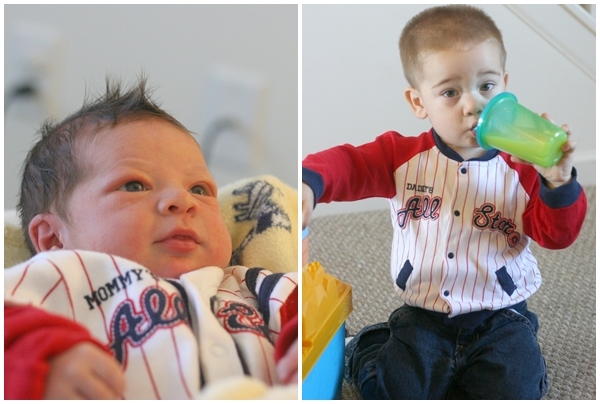 I couldn't resist dressing the boys in similar outfits...they are just too cute! I just can't believe he is finally here! Love this. I'm on birth story overload with all these babies being born, and I love it. You did good, Mama! Your boys are precious. What beautiful healthy children, I am so happy for all of you. Congratulations! Your boys are beautiful! OMG! I missed this completely! CONGRATS!!! Congratulations! What a beautiful story! Oh I LOVE that picture of you and Matt. What a perfect capture of a moment in labor. Congratulations to all of you, the whole family looks so happy and perfect! Your newest boy is glorious! Also glorious? That photo of you and Matt, forehead to forehead. That is a true '1,000 word' type of photo, and when you get a moment to think of things other than what's going on with your boys, that would be a frame-worthy photo. He is SO beautiful! Congratulations to you all! Was Matt more involved the second time around because you went to a birthing center or did you do that as well the first time around as well? They are precious!! And Jack still makes me chuckle with those expressions of his! He is so incredible! I got major tears in my eyes reading your story! SO PROUD OF YOU! Congratulations! Your family is so blessed. Beautiful!!!! Congratulations :) So happy for you and your family! congrats!!! he's beautiful, quite handsome i mean! i had our last at home and yes, intense is a great word! but all together lovely! !